Last week I got a new toy to play with, the iPod nano with video. I bought the new iPod because of it video capabilities. I plan to use the iPod nano to make video for my blog, and add some new features to share with my readers. I have a sample video to share with you, its just little old me. My boyfriend took the video using one of the different video modes on the iPod. It has several modes like Thermal, Mirror, X Ray, Motion Blur, Sepia & Cyborg. The ipod nano is like a fashion accessory so of course I had to get a cute color. I decided on the purple iPod, jus thought it was the best color for my wardrobe. Well enjoy the sample video and look out for more to come. If you would like to see me blog or make a video about any one thing in particular please leave me a comment or email. Enjoy! I am always on the look out for affordable, fashionable and stylish plus size clothing. I came across an unexpected retailer with some cute items, Kohl's. Not sure if they have store all over the country, but you can order online. 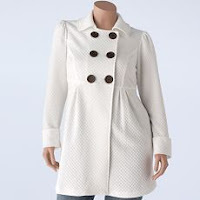 In my daily web surfing sessions I came across a few Kohl's plus size brands that I would buy. 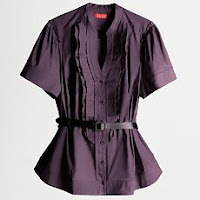 I have known able ELLE (yes like the magazine) clothing line, but didn't know they are now doing plus sizes for Kohl's. 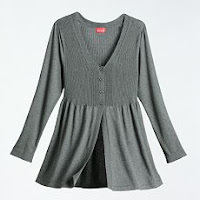 Along with Elle, found some other very cute and very affordable tops. I think I need to go to my local Kohl's and give them another chance. I have been to Kohl's when they first come to California but was disappointed with the plus size selections. I fell in love with Vera Wang's line for Kohl's but as usual it did not come in plus sizes or any size remotely close to fitting me. I think we need to get Vera on the plus size band wagon. In the mean time check out their other plus size brands and decide for your self. If you have been following my blog you know I am all about finding fashionable plus size clothes at bargain prices. You also may have noticed by reading my blog I am a fan of Rachel Zoe. 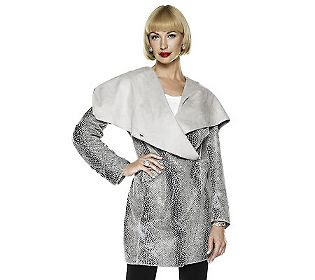 I have been trying to combine both worlds (bargain fashionable clothing while channeling Rachel Zoe styling tips) I hope you are all reading The Zoe Report, then coming over to Chunky Curlz to find my Plus Size Universe version of Rachel Zoe's picks. On Saturday September 17, went for my weekly Target trip, I go about once a week, Love me some Target! I quickly dash over to check out the Anna Sui Line for Target. All I have to say is "I Die", ok I didn't really say that but RZ would have. The Anna Sui line for Target is just so great, I loved the styles and quality. What I didn't love is the sizing, some items do go up to XL, but they are still fairly small. Definitely not plus size friendly. I did try on 2 sweaters that actually fit me, but still wasn't convinced I should pay $49.99 for a sweater at Target. I would have to say the Anna Sui for Target clothing line is definitely a boho chic look. This week on The Zoe Report, Rachel features prints, and her favorite Anna Sui Dress from Fall 09 collection. In the parallel universe she spotlight a Anna Sui dress from the Target collection. Well being a plus size bargainista, I had to find my Plus Size Universe version that not only fits in size, but also fits the budget. Target has been expanding their plus size women clothing selection, and in my opinion been doing a good job. I don't think they are where they need to be yet in plus size fashion, but headed in the right direction. I found 2 dresses at Target from Mossimo that channel that Anna Sui Bohemian style that Rachel Zoe does so well. Add your own touches to personalize them. I would wear them with tights or leggings and some boots and maybe a motorcycle jacket. Hope you enjoy my Plus Size Universe picks. I love to hear your comments and thoughts so don't be shy! When I started this blog I intended it to be mainly about issues and concerns regarding the plus size woman. It evolved into a blog about fashion for the plus size woman. Like many other fashion blogger, my dream job would be working in the fashion industry in some capacity, mainly as a stylist. Although I currently don't work in a fashion related job. I still hope one day to have my own business either as a stylist/personal shopper or a fashion photographer (my hobby at this time is photography.) Well like any other career you must learn the tricks of the trade. I have in the past couple years been reading and watching many fashion related books and movies/shows. 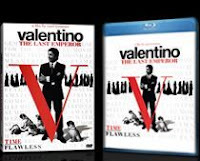 Today the documentary Valentino The Last Emperor was released. I was not able to watch it at the theater since it was not showing any where close to my home. I am really looking forward to watching at home and seeing all the behind scenes from Valentino. The behind the scenes with all the craziness and drama is where the magic of fashion happens. Along with Valentino, I am also looking forward to watching The September Issue with Anna Wintour, which is said to be the "real" Devil Wears Prada, which I also loved. Watching fashion movies & documentaries helps me get a better sense of what it takes and what you need to really work in the fashion industry. Along with the documentaries, I also have read several fashion books, mainly about styling. 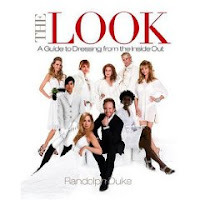 The two most recent books I have read are Tim Gunn's A Guide to Quality, Taste & Style as well as The Look: A Guide to Dressing Inside Out by Randolph Duke. I like to read different perspectives of fashion, from the designer to the stylist to the fashion editors. Each one has a take on fashion and knows how to apply it to various types of people and body shapes. My goal is to keep learning about fashion, so I can one day have it pay the bills. I don't think anyone person in the fashion industry can say they know all about fashion. The fashion industry evolves and changes so much that you can never stop learning and improving on your craft. So to all you fashionistas & stylish woman, don't stop learning and growing towards being fashionable and fabulous no matter what your size or style is. I not only read books about fashion, but also love reading other plus size fashion blogs. I honestly think reading other blogs has taught me more than any book. I have gotten so much inspiration and confidence from other plus size bloggers. I hope my blog does the same for you, so don't hesitate to leave me your comments and suggestions so we can all learn to be more fabulous stylish beautiful plus size women! Today's post from The Zoe Report focuses on jumpsuits. I remember wearing them as a kid, in stripes, flowers and bright colors. Rachel Zoe is showing a few different styles for fall, as her favorite picks. I searched high & low to find a few picks of my own for my Plus Size Universe. These 3 jumpsuit I found are for many different body shapes & styles, from the young fashionista to the mature stylish woman. I like the look of jumpsuits but still not sure I will buy one myself. I think I need to go try it on and really decided if I will jump on the Jumpsuit wagon. Hope you enjoy my post, I look forward to your comments and suggestions.